G.A.C.K. started as a competition entry to build a S.E.U.C.K. remake, based on the C64 original. Since then, many changes have been added so the workflow is easier to understand and more comfortable. The current version G.A.C.K. is a lot more than just a remake. 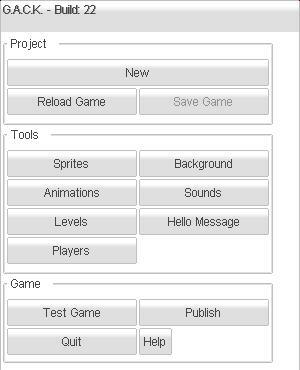 It's a fully featured game maker with export options for many target platforms. With this App you can create games that can be played by a single person or with two players simultanously on devices that allow the controls. You should be able to distribute your game to many platforms. See the exports section in this manual for details. GACK has a GUI that is much easier to use with a mouse or touchscreen than with a joystick back then. OK, the Amiga version had that, too, but then there was a very hard limit on visible sprites. That's gone, too. 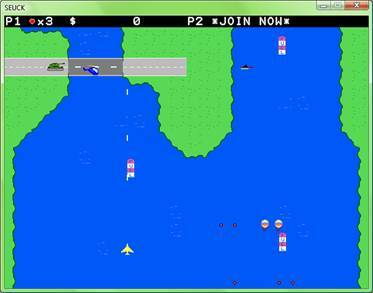 You can produce the enemy occurrence you're used from games like "WarBus" easily on modern hardware. Did I mention this baby has pixel perfect(c)(tm) collisions for everything? You can spawn attack waves at different visible trigger-positions, thus entering one wave, make ten enemies fly the same route. The levels can scroll sideways, too. They start at the bottom and move upwards, but when you make them wider than the screen, the players can move sideways, causing the screen to scroll. 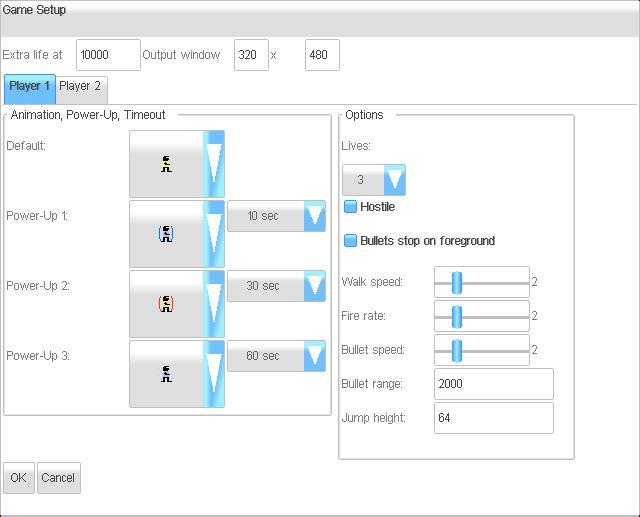 Options for horizontal scrollers and jump&run games have been added as well. The image and animation editors have copy/paste support and some other useful features. Saved game files are astonishingly small, too. (At least for this century). Basically you just draw images as "Sprites", that's everything that moves, and "Backgrounds", that's - yes - what not moves. Next, you define how the animations for each player or enemy would look like. 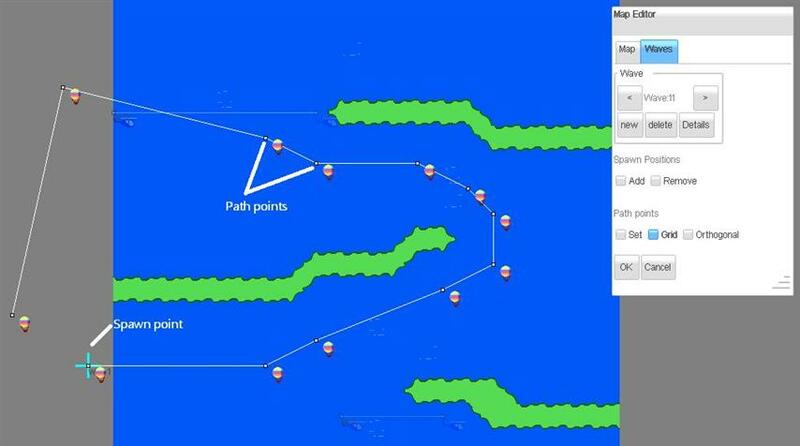 Then you use the map editor to paint the levels on 2 layers. The background is just for show. The foreground can optionally stop the players, or kill them. After the scenery is set, you simply add a bunch of baddies, save the game and heat the triggers. Once you passed the splash screen, you'll see a nice main menu for the editor. The first thing you might want to do is load a demo game, and play it. 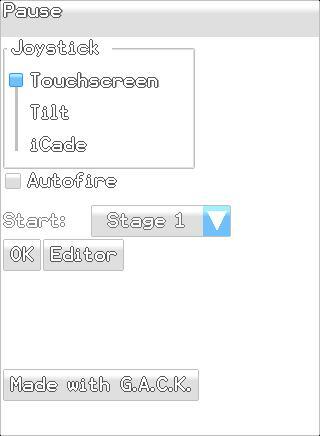 Just klick on the topmost button to get a file list with all the games on your device. Select a game and press "OK" to load it. Then fiddle with the exiting game, change a few bits here and there before you finally start your own work. When you return to the App, the last state is always restored. You can push the "Reload Game" button to load the last state that you explicitly saved. Pressing the "Save Game" button writes the changes to the document you are currently working on. You see, change or rename that project when you press the topmost button, that's named after your project. If you press OK, the changes are stored. With Cancel you can discard all changes made on the images. In the toolbox you find few tools as Draw/Fill/Flip/Rotate/Move that act on the full image. Just play with it, it's no big deal. Using the "Copy rect" allows you to grab a rectangular portion of the image - just drag a rectangle. The "Paste clip" button inserts the block with the top left corner at the clicked position. The image editors have a palette of predefined colours. You can use these colours all through the whole project. The colour in the left bottom corner (silver buttons) is transparent. In the grid it will be shown stippled. Pressing the Palette button will allow you to change the colour value of a palette entry. All images (sprites and background) will be affected by a change. You can change the size of all background blocks or sprites with the "Size" button at the top of the dialog. Using the "Import" button allows you to load a set of tiles from a bitmap (png, bmp or jpg file) with a given grid size. 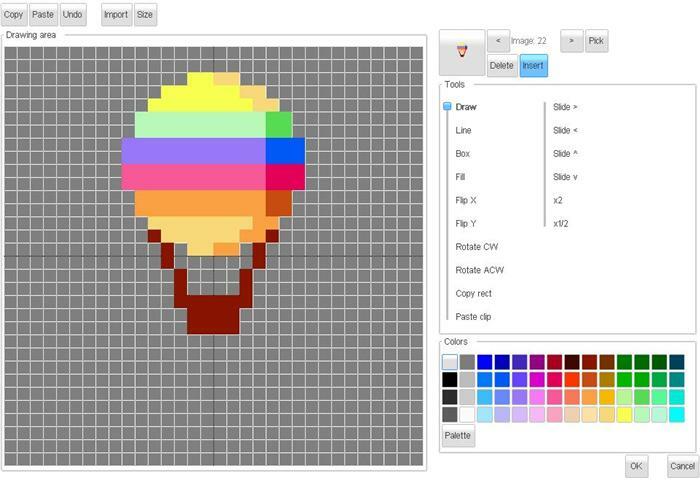 The images are scaled to the size of your current background blocks or sprites when importing. Also, the colours are matched to the closest colour in the palette. Here you define the animation frames for each player and enemy. The top bar let's you choose the animation to edit. Then press the tab strips to select animations for move (walking), shoot (when you hit the trigger), die (when you hit the road) and bullet (that's what you spawn when hitting fire). 8 Way, hold (same as 8 way, but when you don't move, the direction is kept. Sequence, which will be played from frame 1 to the last frame. Here you have the option to add/remove a frame at the end of the sequence. In any case, just click on the button for an direction/sequence, and choose the appropriate image from the list. When you press the cursor keys, you can see the preview image moving. The Speed slider lets you control the animation delay between each frame. Here you have a list of sounds to add into your game. The Exists button indicates if this sound is already defined as a waveform. With the Edit button you can open the legendary Dr Petter's SFXR sound editor. it might look a bt scary a tthe first look, but it's easy to use. Very. Just start with the box at the top left corner. Pick a sound family that might fit the sound you are looking for. Then press the Generate button until you hear a random sound that sound just like the thing you need. 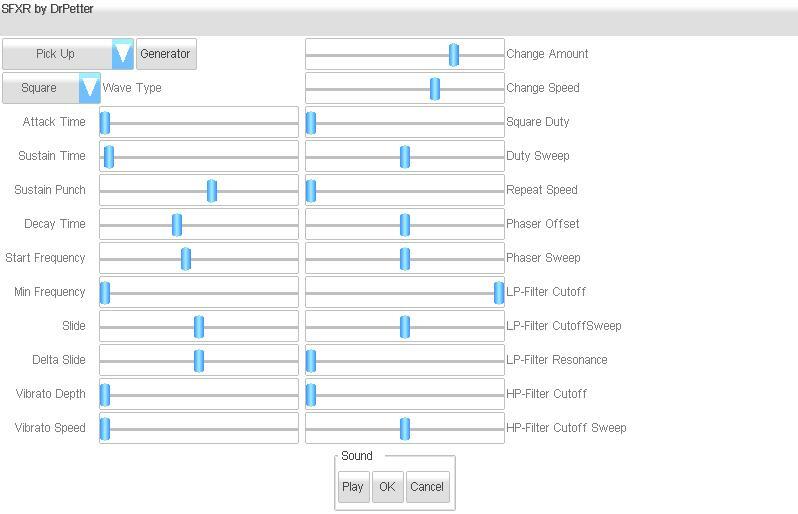 Then play a bit with the various sliders to adjust the sound. The Play button plays the newly generated sound. The most complex thing in G.A.C.K. 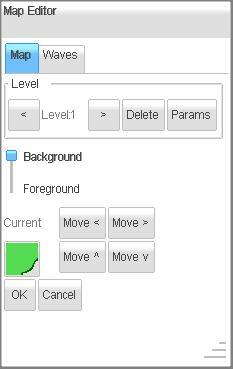 is the level editor. I really recommend reading this section carefully. It's easy to use, once you got the idea behind it. On the top you see tools to select the current level, and to remove it. When you click ">" the program will ask you to create a new level when you reached the last one. 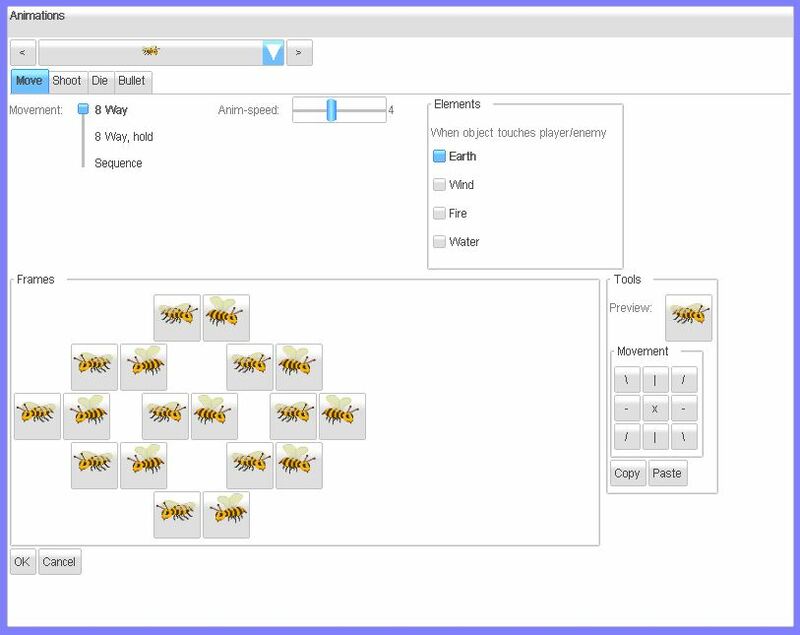 Below that, there's the option to change the "Map" or edit "Waves", which is the movement patterns of the enemies. You can move this dialog around by dragging the caption bar. With the middle mouse button, LCtrl pressed or two fingers on the screen, you can pan around. In map mode, there's a big button "Current", that shows the current block to set. When you click it you can choose another block. The block "Eraser" just cuts transparent holes in your map. The background is just arts, the foreground can interact with the players (see Players menu). The whole game has pixel perfect collisions, btw. As you see, you can move enemies below the foreground. That's useful for fancy effects, like people coming from behind a house or hide behind a tree. If you need the enemies above that layer, try to draw to the background instead, and add dummy blocks to the foreground for collision (with just one pixel or so). Also, the enemies are sorted by y position for each frame update. Sprites at the top of the screen are drawn first. The "move" buttons move the whole playfield. That's handy, when you have to resize the map. Still: no movement at all. Set a limited time for that. Used for bosses .e.g. In Still mode, the enemies are spawned when their spawn point is in the visible area of the screen. You can cause a delay for their appearance by making them move for a time outside the visible screen. In wave mode you create new enemy attack waves, dynamic object that might shoot collectable power-ups or other dynamic game content. With the Wave- combo box you can pick the enemy waves already created or append a new wave at the end of the list. Waves might be sorted by position eventually, so don't get confused when that happens. Next you should set the Details of the wave. The details editor is covered later. When you select an animation in the details, the values from the last enemy with the same animation are preset. That makes it easier to create new, similar enemies. Now you can add path points. When you click the option New in tha pathpoints area, all previous path points are removed and you can restart with the starting point.. The option Grid aligns your placed points at the grid of the background blocks. When you place a path point, you can adjust the position until you finally lift the click/tap. Using the Orthogonal option, every neighbour point can only be vertically or horizontally be placed on the same position as the previous set point. Thus, this diables diagonal offsets. Compound fractions You can add more compounds (parts) to one enemy, to build bigger enemies. Each compound part has its own parameter, described below. Just remeber: G.A.C.K. sorts all sprites by Y (vertical) position, so that sprites at the top of the screen are drawn first. Have that in mind when you create compound enemies that overlap. Compound offset Here you specify how many pixels the compound part os offset to the path points you enter. In the map - view, you will see the complete compound enemy preview. Animation Select the animation from the animation list here. 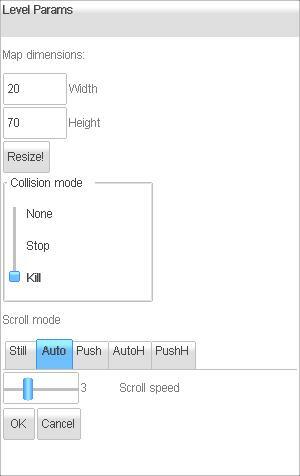 The editor will automatically set all the values below to the last (upmost) used settings applied to this animation. Lives How many shoots can this one take to die? Fire rate How many bullets per micro second. No, honestly try the fire rates until it feels right. Bullet speed Bullet movement speed. In pixels per frame update. Heart of Compound If you have a compound of enemies as one big enemy, you can select specific compound parts to act as a heart. When the heart is killed, the whole compounded enemy dies. Repeat Path With this flag, the enemy will skip to the first path point when it reaches the last point. Without this flag, the enemies of all spawn points for this wave will align side by side at the end of the path. Enemy dies on bullet When a bullet of has any of the 4 elements shared with this enemy, a hitpoint is dropped from the enemy. Bullet stops on Enemy otherwise it would fly straight through. Beware! A fly-through bullet would drop several hitpoints. Player dies on Enemy Touching this enemy, if it shares any of the 4 elements of the players "die" animation, will drop a life from the player. Enemy dies on Player When the die animation of the enemy shares one of the 4 elements of the player, the enemy will drop hitpoints. Use this option for collectable power-ups. Can be jumped on This enemy can be harmed by jumping on its head if the player's 4 elements share common elements with the enemies die animation. This flag is only valid for gravity levels. The player will experience a rebounce after the head-bounce. If the "dies on player" option is set, you can also jump from the bottom towards such an enemy. This can be used to simulate the 10-coin boxes in Super Mario(c) style blocks. You can create a compound to create a boss that must be head-jumped to remove the armour first... Lots of ideas here. Changes player to Select a power-up that the player is changed into, when this enemy dies because of a player or a player's shot. 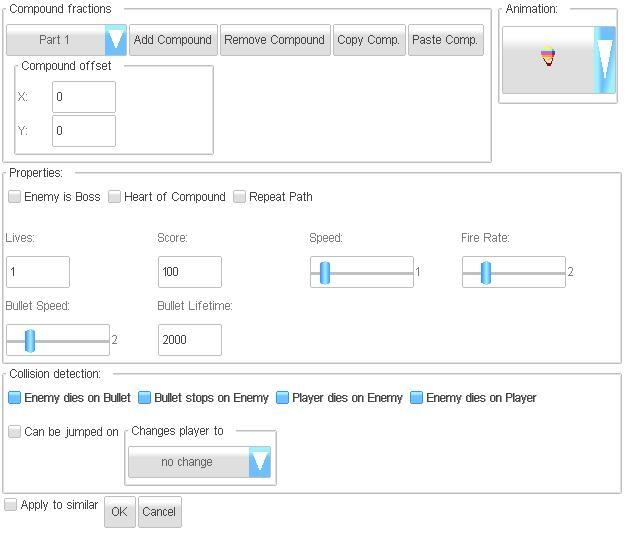 Apply to similar This checkbox will apply these settings to all enemy objects with the same animation on this level. This way you can easily change the behaviour for an enemy type, to tweak bullet speeds and such. all bosses are shot or below / left of the visible screen. Here you can enter a message as a title screen. The message will be centred, but as a block, not per line. So you can use ASCII art if you feel pervert. 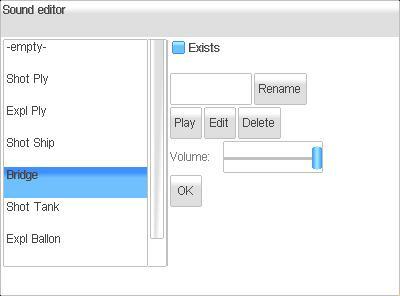 Specify the player behaviour for each player in this dialog. The current version supports a hardcoded number of two players for G.A.C.K.. Lives Number of lives for this player. No continues. Jump height The maximum height in pixels a player can jump in levels with gravity. This is a test run of the game. If you press "q" or tap the score-bar, the testing will end. Before starting the game in editor mode, you can select the start stage from the pause dialog. In the distributed game this option will be removed. On a PC or Mac you can you can skip the current level in editor mode with the Page-Up key. You can get a program on our website that lets you create standalone packages for several platforms from your created games. 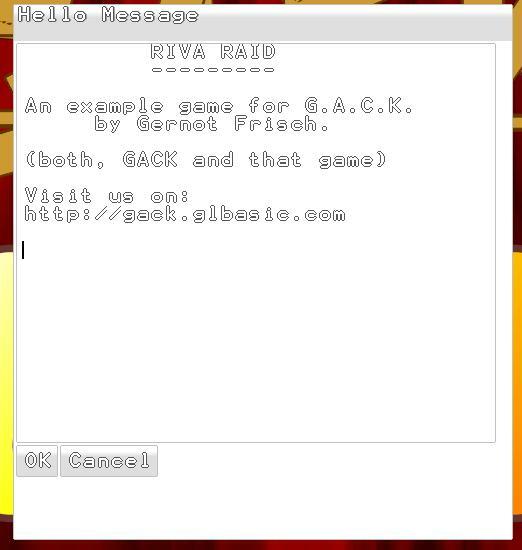 Just visit http://gack.glbasic.com . This game and all used material is © by Dream Design Entertainment. That's the GACK game editor. Not the games you create with it. The SEUCK-player program is free of any rights, and you can distribute your game with whatever-you-want license. with whatever-you-want license. Many thanks to Minion, who pointed me always the right direction when I was undeceive. Kudos to LamptonWorm who initialized the idea. www.glbasic.com – G.A.C.K. 100% GLBasic code.